Okay, you’ve just purchased a Glock 27 (a very nice firearm, by the way) and now you’re in the market for a holster. There are a number of different brands and models out there, so which Glock 27 holster has the best features, and is the best value for your money? After looking at a number of well-rated holsters for my Glock, my choice as the best overall holster is the CYA Supply Co. inside-the-waistband (IWB) holster. 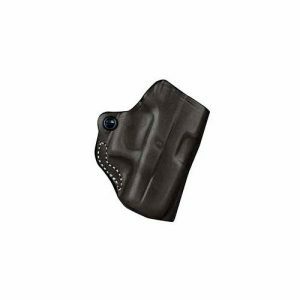 This holster had the best combination of price, features, quality construction, good concealment and positive retention. And as a bonus, CYA Supply Co. is veteran owned, and all their holsters are manufactured in Texas. 1 So what type of holster do you need? So what type of holster do you need? But before you run down to the gun shop or start looking for a holster online, you should decide how you’ll be carrying your Glock and what you’ll be doing with it. For example, if you’ll be carrying the firearm concealed, you’ll want an inconspicuous holster that fits well under even thin clothing. If you’re a competition shooter, you’ll want a holster that’s specially designed for a quick draw. And you’ll want a straightforward, durable holster if you plan on using the gun for hunting, or for protection while camping or hiking. And there’s also the consideration of whether you’re right or left handed. Many holsters are one-sided, i.e. they’re designed for right or left-handed shooters. And some people prefer to “crossdraw” from the opposite side of their dominant hand. So let’s take a look at some of the more popular holster types so you can decide which one is the best for you. These are the traditional-type holsters that many people are familiar with. Many law enforcement officers use these holsters, and they’re typically made from leather or nylon. They’re worn outside of the clothing, either on the right or left side. These holsters have a flap that folds over the top of the firearm, securing it in place. This provides superior retention, as well as protecting the gun from the elements. That’s why this holster is recommended if you’re going to be outdoors in the rain or snow for any length of time. Just be aware that the flap will slow down your draw in an emergency situation. These are known as Inside the Waistband, or IWB holsters. This is a simple belt clip/slide holster, and is a good choice if you’re just planning on carrying around the house or yard. These holsters clip to your belt – or the waistband of your pants – and are probably all you need for an everyday carry. IWB holsters for the G27 (and other Glocks) come in a variety of materials, from leather to nylon to polymer plastic, and they range in price accordingly. Tactical shoulder holsters have a set of straps that suspend the firearm below the left or right arm. This can be a good choice for hunters or fisherman, especially if you’ll be carrying other gear on your belt. A shoulder holster is also makes for a good concealed carry option if you regularly wear a suit, blazer or sports jacket. These are usually worn cross-draw, and can be switched from the left to right side depending on your dominant hand. Many of them also come with pouches for extra magazines. If a fast draw is your goal, then a speed holster is your best option. Competitive target shooters or anyone anticipating quick-draw situations should consider a quality speed holster. Look for one that’s made from quality materials, and has different user-adjustable settings so you can configure it for the position that’s best for you. A pancake holster is similar to the IWB type, but is designed to be flatter and smaller for concealed carry use. Since they have a thinner profile, they’re usually undetectable even under thin clothing. These holsters are typically made of nylon or leather, and they fit securely onto a belt. One drawback of this type of holster is the fact that they’re usually open at the barrel end, leaving your gun barrel exposed to the elements. If your weapon has a tall sight it might also catch on the holster when drawn. Now that you’ve seen the different types of holsters available, it’s time to narrow down your choice to a few specific brands and models. Some things to consider when choosing a holster are whether you need a right, left, or cross-draw model. Also factor in the size of your gun barrel, and the height of your sight when making a decision. 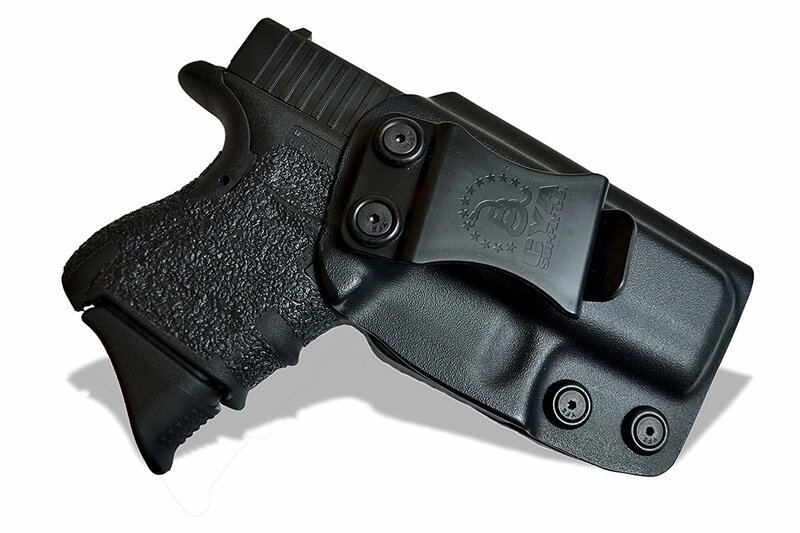 This is an inside-the-waistband (IWB) holster that’s a good concealed carry choice and a great overall holster. This holster is made from Boltaron thermoplastic, which is rugged, abrasion resistant, and keeps its shape even in high heat situations. The cant is adjustable from 0 to 15 degrees. Just use the provided hex key to loosen the screw on the belt loop and adjust as needed. CAY Supply Co. designed this holster to have less friction than comparable models, which means less wear on your firearm, and a better draw and re-holster. This is another IWB holster and this minimalist model is lightweight and durable, and will protect your Glock 27 against the elements. Keeping your firearm in place is not a problem with Concealment Express’ ‘Posi-Click’ audible retention lock system, and there’s an integrated sweat shield as well. 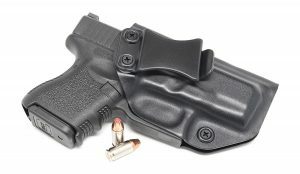 This thin, lightweight holster is ideal for everyday conceal carry of your Glock firearm, and it’s easily hidden no matter how you’re dressed. Carry angle (cant) can be adjusted from 0-15 degrees depending on your preference. My only complaint with this holster is that the inside flap rubbed my side after a long day of use. Unlike the other models listed above, this model is a paddle holster, meaning it utilizes a flat, shaped piece of polymer plastic and is designed to inside the pants for concealed carry. This Blackhawk paddle holster is constructed of injection-molded polymer plastic to conform to your Glock 27, and is angle adjustable. With this holster, you won’t have to worry about your firearm coming out accidentally. The Serpa features an auto lock system and a retention button that will keep your weapon in place in any conceivable situation. The holster can also be adjusted to different angles, or cant, depending on your preference. One thing to be aware of with this holster, with its retention locking system, is you’ll have to do a lot of practicing with your draw. You’ll need one hand to press the retention button while you draw with the other hand. All-in-all this is a good holster, especially if you’re concerned about someone taking your weapon without your permission. Good minimalist holster that’s short of frills but is well constructed from black or tan leather, and is worn on a belt outside the pants (OWB). A nice concealed carry holster under a jacket or loose shirt. 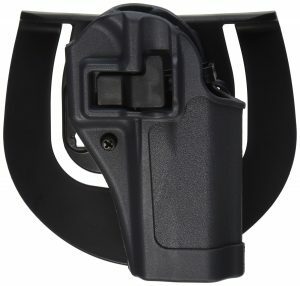 The holster offers good retention due to its precision molding and adjustable tension device (adjusted with a screw). The holster attaches via a belt loop. The mini scabbard will accommodate belts up to 1 ½ inches wide. Overall a good choice if all you need is an inexpensive holster for the range or around the house. The construction is good, and this Glock 27 holster should hold up well even after years of use. At this point you should have a pretty good idea of the type of holster that would work best for you. In some ways, your holster is as important as your firearm, especially if you conceal carry, so shop around and don’t skimp on this critical accessory. CYA Supply Co. a member of NRA Business Alliance. We make our holsters with the end user in mind. We have put much attention to our materials, design and process to bring you a top of the line holster at a better price. One of the most important consideration when choosing a holster is its material. If you’re main concern is price, then nylon is a good choice, but be aware that it isn’t as rugged as the other materials. Leather and the polymer plastics are more rugged, and hold their shape better, but expect to pay more for these benefits. Much will depend on how – and how much – you’ll be using your new holster. 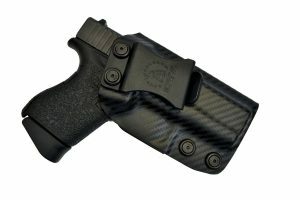 As mentioned in the introduction, my choice as the best holster for Glock 27 would be the CYA Supply Co. IWB model. While all of the holsters listed above had their strong points, the CYA Supply was the best buy for the money in my opinion. Plus I like the fact that it’s made in the USA, and supporting veterans is something I believe in.